Up on North Tryon Street at NoDa Brewing Company, Chickspeare is flipping the script again. 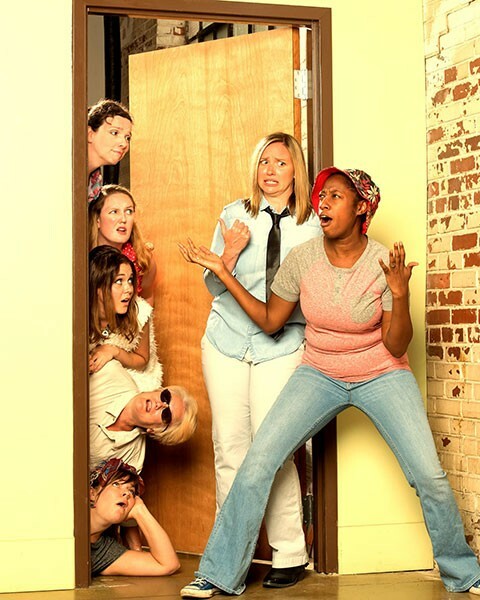 Founded upon the principle that Shakespeare’s works, originally performed by all-male companies in Merrie Olde England, can also be performed by all-female companies in Modern America, Chickspeare now propounds a new heresy. Although the Bard’s first great work, The Comedy of Errors, has its roots in Ancient Rome, why can’t we equate this trusty old farce with our own dopey TV sitcoms? Executing this audacious concept, Chickspeare director Andrea King decrees a modicum of pruning and reshaping upon the script, along with hefty helpings of mugging, styling, and profiling from her hambone cast. If that weren’t enough to win us over — and it definitely was last Saturday night — then there’s the prepaid cupful of NoDa Brewing’s draft beer to further lubricate our receptivity. Four different brews were flowing from the kegs. As the old story unfolds in modern dress, linkage to American sitcoms comes largely through familiar theme songs. When the luckless Egeon tells how his twin sons, both named Antipholus, were separated during infancy along with their parents, the fateful sea voyage is evoked by the familiar shipwreck of The Minnow immortalized in the ballad of Gilligan’s Island — plus an extremely cheesy scene change. Later when Antipholus of Syracuse marvels at the fact that everyone recognizes him in Ephesus, where he has never been before, his astonishment is punctuated by the theme song from Cheers, that Boston pub where everybody knows your name. Action comes fast and quick in this Shakespeare in the Park(ing Lot) production, so I didn’t keep track of all the sitcom and game-show themes that zoomed by, or whether references to The Jeffersons, Mission Impossible, Laverne and Shirley, and The Beverly Hillbillies were linked quite as cunningly to the text. These “Chicksbeer” shows are all outdoors, with a nearby food truck supplementing the brewery offerings, but the evening performances beginning at 7 p.m. make some extra buffoonery possible as the Ephesian nitwits take multiple stabs at pointing to the setting sun. Two sets of identical twins scurry about during this carnival of confusion, for the two Antipholuses are served by two Dromios who were also separated during infancy. Their befuddlement can only be sustained if they don’t meet, so it isn’t until deep in act five that all four of our protagonists must appear simultaneously before us. Historically, directors have relied upon actors’ height, costumes, and grooming to bridge the inevitable gap in physical appearances. Only recently have I seen or heard of directors who explore the comic possibilities of radically mismatching the identical twins. King adopts yet another strategy. Perhaps inspired by her own recent experience in PaperHouse Theatre’s Much Ado About Nothing, where she was briefly Dogberry and Leonato simultaneously, King has cast Caroline Renfro as both Antipholuses and Tania Kelly as both Dromios. Talk about flipping the script! In most productions of Comedy of Errors, we’re challenged to perceive the twins as identical in spite of their obvious physical differences. At the NoDa Brewing Company parking lot, we’re challenged to keep track of which identical twin is which. A couple of visual aids are helpful. When Kelly is the Dromio who dwells in Ephesus, she dons a dopey floppy hat, and when Renfro appears as the Syracusan Antipholus, she flips out a Clark Kent set of eyeglass frames. As you’ll see in the zany staging of her nativity, this Antipholus was actually born with eyeglasses. Additionally, the philandering Antipholus of Ephesus seems to be tipsy for nearly the whole evening. That extra degree of differentiation for Renfro seems justified. With all the thankless errands, unjust castigations, and slapstick beatings that Kelly absorbs as the two Dromios, it eventually ceases to matter which whipping boy is drawing the belly laughs. Except when Dromio of Syracuse is pursued by the amply padded Carmen Bartlett as Nell, Antipholus of Ephesus’ kitchen maid — and his manservant’s massive wife. Kelly works up a delightful lather as she gets most of the shtick, but Renfro generates her share of zaniness, perhaps most memorably when she picks up a mic-like prop and hosts an impromptu segment of … let’s call it The Dating Game. Antipholus of Syracuse is less hotly pursued by his twin’s wife, but the scantily clad Alexandria White definitively stamps herself as the hottie of the house as Adriana, spurned though she might be by the look-alike Antipholus while her real husband is cheating on her. Theme music from Bewitched may have been cued up when the alluring Adriana invited her Syracuse brother-in-law to her home for dinner. Not only can’t Antipholus believe his good fortune, he is smitten by Adriana’s sister, Luciana. Some of the juice seems to be drained from this faux love triangle to trim this production to its desired running time, so we miss some of the sisters’ consternation when the Syracusan obeys his instincts and speaks his heart. Likewise, Dromio of Syracuse’s eventual relief seemed to overshadow his master’s delight in the denouement. So Kacy Southerland didn’t get the fullest opportunity to explore the virtues of Luciana — or their ultimate reward. But she moonlights as Amelia, the local abbess, so she can lavish additional virtue on Egeon’s long-lost wife and gush forth the bliss of her reunion with her children and her husband. Arrested in the opening scene for being a Syracusan on Ephesian soil, Amanda Liles isn’t seen much as Egeon after narrating the hilarious sea saga that sets up the plot. Not to fear, she resurfaces as the frustrated goldsmith, Angelo, who can’t get paid for the necklace he fashions for the philandering Antipholus — and as the courtesan he’s two-timing with. Of course, Egeon must be there for the sentimental reunions, so Liles has her schizoid moment, splitting into Angelo as all is settled. Cara Wood is the Duke of Ephesus, who — mercifully? — grants Egeon 24 hours to raise the ransom money that will enable him to avoid execution for his trespass. We need more Duke at the end when the terrified Antipholus of Syracuse and his Dromio take refuge at the Abbey and the implacable Adriana wants her husband back. Wood tosses off the Duke — and an arresting officer in the necklace affair — with far more distinction than we usually see, never detracting from the merry mood. Chickspeare has a knack for broadly entertaining while duly honoring the Bard, making the texts accessible to common folk four centuries after they played to the groundlings. Symptomatic of the troupe’s sure touch here is how they treat the often intimidating soliloquies. Instead of making them occasions for declamatory orations, they’re prerecorded and presented as interior monologues, brought down to the level of cartoonish thought bubbles that pop with crass and delicious effervescence. Yeah, the Chix banditas understand what contemporary audiences crave, and their Chicksbeer series deftly taps in.